The Get Up Kids. Photo by Aaron Rhodes. 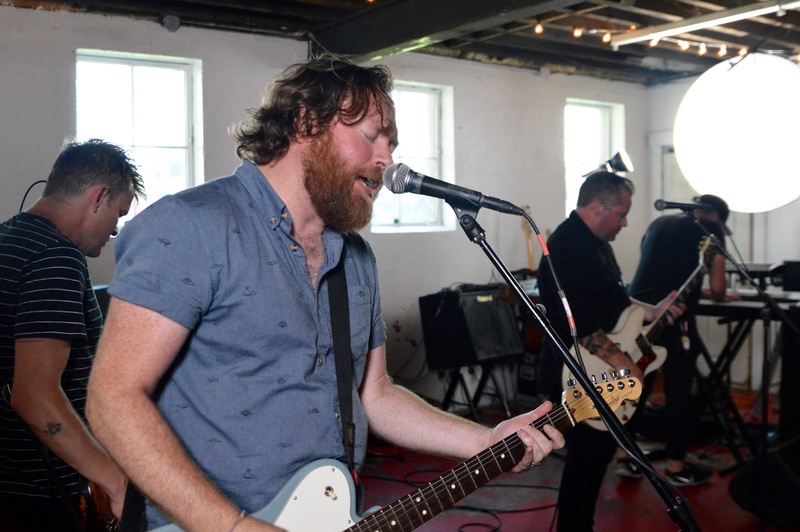 On a hot summer's afternoon (July 26), roughly 100 friends, fans, and crew members gathered at the White Schoolhouse for a Get Up Kids video shoot. Kids and teenagers -- members of LK Ultra among them -- rode bikes across the front lawn as the adults lined up for additional shots, stretching around the historic building and dodging a few wasp nests. Once the narrative shots were done and everyone had worked up a good schvitz, the band set up shop in the basement. Matt Pryor remarked about keeping basement sets to half an hour or less, and that's what they did. After playing three renditions of the video song, "I'm Sorry," a punchy apology anthem from the band's recent "Kicker" EP, the boys jammed a few other new tracks, and indulged longtime fans with a handful of "Four Minute Mile" and "Something To Write Home About" favorites, played with their usual vigor.